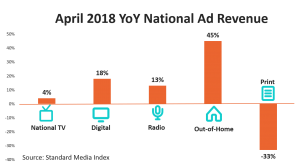 Standard Media Index, the only advertising intelligence firm to source detailed and complete data directly from the major agency holding groups, unveiled national advertising revenue figures for April. National TV increased ad revenue 4% in April YOY, with Cable up 6% and Broadcast flat. These figures exclude the NCAA Basketball Final Four Semifinals, which took place in April last year and in March this year. Within Cable Television, News saw the largest growth at 21%, followed by Sports at 16%, excluding the NCAA Basketball Tournament. Cable Entertainment grew 4% in April YoY with ad revenue from syndicated shows increasing 15%. This rise in Cable Entertainment revenue is attributed to a 6% increase in the amount of 30-second equivalized spots; meanwhile, Paid Unit Costs dropped -5%. 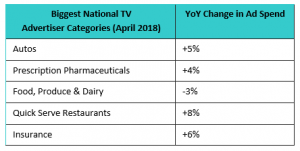 Primetime Television revenue lifted 5% this month YoY, as advertisers paid more in the Scatter market, driving TV networks’ revenue from Scatter buys up 14%. Within Primetime, CBS grew the most of the Big Four Broadcast networks, rising 14%. This was followed by ABC up 9%, FOX up 3% and NBC up 2%. These figures exclude the NCAA Basketball tournament. Primetime Original Programming revenue grew 11% this month, as the amount of 30-second commercial spots increased 9%. This includes new episodes of original comedy, drama, and reality shows across both Cable and Broadcast. Singing competition shows – specifically NBC’s “The Voice” and ABC’s “American Idol” – brought in the most revenue at $60 Million and $48 Million respectively. This was followed by FOX’s “Empire” at $18 Million, AMC’s “The Walking Dead” at $17 Million, and ABC’s final season of “Scandal” earning $15 Million. The most expensive show in April was FOX’s “Empire,” which charged an average $316,737 for a 30-second spot. While each of the Big Four grew revenue from Primetime Original Comedies, FOX nearly doubled its revenue in the subgenre, rising 91% in April YoY. “Brooklyn Nine-Nine” was the largest comedy earner for the network this month, growing 41% YoY, followed by “The Simpsons,” which tripled its income for the network. National TV has ushered in a resurgence of familiar programming. Networks have not only revived decades-old programs, but they have also created spinoffs and prequels of current shows. From an ad perspective, this strategy is working when it comes to comedy. The four most expensive comedy programs this month were: CBS’ “The Big Bang Theory” charging $267,267 for a 30-second spot, followed by NBC’s revival of “Will & Grace” at $205,829, then CBS’ prequel “Young Sheldon” at $183,408, and ABC’s revival “Roseanne” at $167,159. Despite “Roseanne” being ABC’s #1 original comedy this month, the network decided to cancel the show on May 29th after racist tweets from the show’s titular star. Beyond that, several programs returned to the small screen after getting picked up by a new network. For example, “American Idol,” which aired its final season on FOX in 2016, returned to ABC this March with a new cast of judges. While the show was a revenue heavyweight for ABC this month, the paid unit cost for a 30-second commercial on “Idol” in April 2018 was $119,200, which is 39% lower than it was in April 2016. Television Sports revenue is up 9% this month, when factoring out the NCAA Basketball Final Four Semifinals, which took place in April last year and in March this year. The NBA brought in the most TV revenue in April within the Sports genre, up 6% YoY. When looking at the NBA’s entire regular season, which ran from October 17 to April 11, revenue was flat YoY. Meanwhile, the NCAA Basketball March Madness Tournament concluded in April, bringing in $546 Million for the entire tournament – a 3% decline from last year. The MLB opened its current season on March 29th, and TV revenue is up 25% YoY from Opening Day through the end of April. This comes from an increase in the number of 30-second commercial spots as the average paid unit cost fell -5% YoY. The Big Three Cable News networks – FOX News, CNN, and MSNBC – have maintained the strong growth they have seen this year, earning 24% more ad revenue than April last year. CNN earned more revenue this month than FOX News for first time since December 2017. MSNBC grew the most, gaining a momentous 71%. Looking at weekday primetime programming, the paid costs for a 30-second spot increased significantly for the quarter at each of the Big Three networks. FOX News grew 34%, CNN increased 57%, and MSNBC jumped 95% YoY. FOX News has upheld the highest prices for weekday primetime shows. Looking at advertiser categories across National TV, the Auto industry was the largest spender this quarter, growing +5% YoY. That is followed by Prescription Pharmaceuticals (+4%), Food, Produce & Dairy (-3%), Quick Serve Restaurants (+8%), and Insurance (+6%). 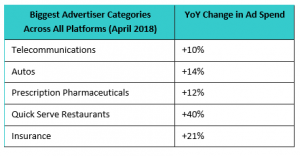 Looking at advertiser categories across all platforms, each of the top five categories increased spend compared to last year. The Telecommunications industry was the largest spender in Q1, increasing +10% year-over-year. That is followed by Autos (+14%), Prescription Pharmaceuticals (+12%), Quick Serve Restaurants (+40%), and Insurance (+21%). Standard Media Index is an advertising intelligence company helping media companies and investment managers determine ad revenue streams, pricing and planning models, and competitive benchmark analysis. SMI provides the actual ad spend and unit costs so clients can tackle high-stakes decisions with confidence. SMI sources data directly from agency invoicing systems for the most accurate and granular view into the media ecosystem. Headquartered in New York, with offices in Sydney, Madrid and London, companies across the world turn to SMI to reveal hidden opportunities and help drive better results. For more information and resources visit www.standardmediaindex.com or join the conversation on Twitter and LinkedIn.